Have you ever driven over something while driving your RV and broken something? Like your steps? Well.. we did and tore the steps right off!! Amazing or Aggravating right? So.. here are my links to buy and install new RV steps. Check them out!! Just sitting here thinking of things that we might possible have to do to upgrade the RV. One of the things I can think of is how to keep the Rv cool in the heat or for that matter to keep the cold out? Will have to look at other RV’Rs blogs and see if they came up with anything other than running the AC. The Lord has Risen!! Happy Easter to all my Family and Friends on the Ground, in their Trucks, RV and on the road!! Peace be with all of you!! When our Kubota generator gave up the ghost on our Semi Truck , we were very annoyed. We went through a few inverters, and generators. The first one we tried was a Generac inverter. We crushed it.. (smiles) so we got another one, well it didn’t last long either. The next one we bought was another Generac, this time was a portable and it kept burning through resistors and brushes, and expensive. We also tried Troybilts. I gotta say they worked pretty well. They were expensive as well and lasted less than a year. We were going through Oregon and by gosh if the second Troy Bilt exhausted itself as well. (a tip) if your ever in Oregon they do not charge a sales tax! 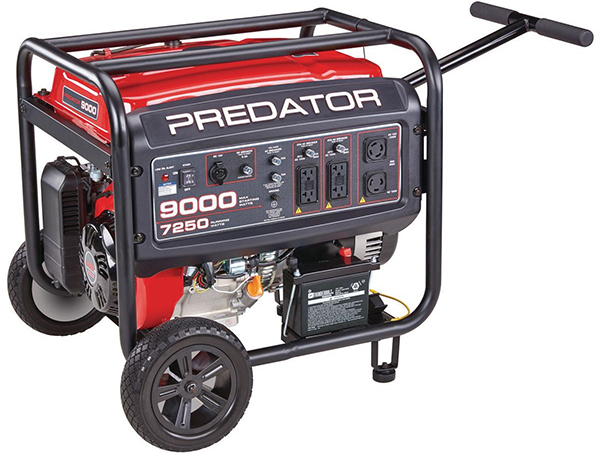 We stopped at a rest area, and I just happened to see a 4-wheeler truck with a generator called the Predator and thought to myself, I’m going to ask the gentleman about it.. He said go to Harbor Freight they have them for $599.00. He praised it very highly! Right away on got online and looked up Harbor Freight and we bought one. We were very pleased with it. It was a 7000/8250 kw and lasted over a year on the back of the sleeper. We did have to buy a second one which we stuck on the back of the RV on a Wheelchair lift. It is a little loud, but very dependable. I recommend them highly! If you can afford it, buy the extra warranty, as they will replace their generators no questions asked. Using it in a truckstop we never had any one beef about it. In a RV park, maybe we would get a few grumbles. The best Portable Generator on the Market! If you have a big sleeper truck it’s no different than living in an RV. You have all the amenities in a big sleeper that an RV has. Of course just like anything else, depends on how much money you want to spend on either and how much money your earning to do the upkeep on your Truck or RV. When you have a big sleeper truck, it does matter what kind of truck as not all trucks weigh the same. We had a 2000 Western Star and the front axles were 13,800 lbs, and with the sleeper we were 38,000 lbs, so we were kinda limited as to how much freight we could carry on the trailer unless we could manipulate it. By gosh, you should see some of the big sleepers on the road! They are amazing!! With the RV, you have to be careful to not carry too much weight as well, as it can get expensive in fuel costs, especially if you have a big engine. I am here in Anchorage, Alaska and it has been a wet, chilly day! Had to come up from the states to help my older parents buy a car, as theirs got t-boned. No fatalities, thank god. Wishing I was snug as a bug in my RV. Let me tell you a little about myself. I am from a little village of about 500 people on the Kuskokwim River called Aniak, Alaska. Grew up there, then moved to the big city of Anchorage, and Wasilla. Got married,raised three children, worked, got divorced..left my cushy job and moved to California. Worked there for about a year, then moved to Ohio to one of my parents’ homes. That is where i met my significant other in 2012, who drove a semi-truck. That was the start of our life of living over the road! We then went into together and bought a Big Sleeper Western Star. The adventure of living in a truck and seeing the United States while making money was out of this world! Most people get to see only the vacation sites or the tourist areas in a two week period. As trucking goes, we were the front line and I got to see what America was all about! The fun of photography - enjoy each day taking pictures.